Other; tannins, phenolic acids, mucilage (found in the bract). Used For: The herb is known to treat nervous disorders, relieve spasms, reduce arterial tension, induce perspiration, relieve inflammations, promote menstruation, and treat diarrhea. Linden effectively relaxes the nervous system. It may also be applied as a preventative remedy for high blood pressure and atherosclerosis. Moreover, it is applied to relieve hypertension, accompanied by nervous tension, and atherosclerosis. Due to its relaxing capacity and positive action on the blood circulation, the herb may be applied to treat several types of migraine headaches. Its ability to induce perspiration in addition to relaxing the body is used to treat influenza and colds, accompanied by fevers. 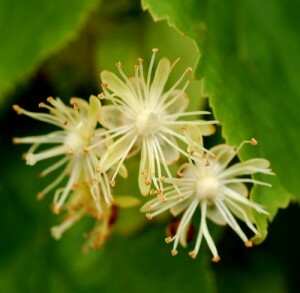 Commonly mixed with: To improve its effect on hypertension, the herb is combined with European Mistletoe and Hawthorn. To reduce anxiety and nervous disorders it is used together with Hops, and to treat common colds it is mixed with Elder Flower. Preparation and Intake: To prepare and infusion, take one teaspoon of flowers and fill it up with a cup of boiling water, steep for ten minutes. The result is consumed thrice per day. To promote perspiration in fevers, taken 2-3 teaspoons instead. In form of tincture the herb is used at a dose of 1-2 ml thrice per day. Safety: There is no data concerning the herb’s safety level. It is possible that the plant interacts with the medicine you use. Speak to your health-care provider before using the remedy.